Dee Williams has launched the Portland Alternative Dwellings website with the web design help of Tammy Strobel of RowdyKittens. The first design they’ve created is the The Don Vardo (pictured below) which demonstrates the high quality craftsmanship of the homes they will build. It’s intended to be a writing/guest studio and complete with electric radiant heat, a kitchen nook, desk, and pull-out double bed. The structure is incredibly stout and built to take the stress of road trips. 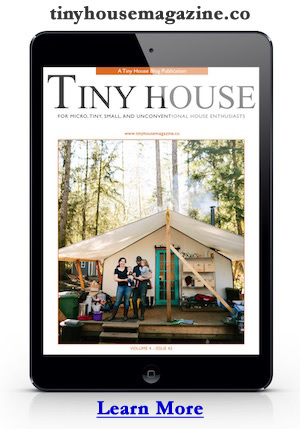 This is one tiny house company to watch. This entry was posted in Builders and tagged dee williams, don vardo, Katy Anderson, oregon, portland, rowdykittens, Tammy Strobel strob, tiny house. No mention of shower/toilet, though. If such tiny houses are built to be part of a community of them, with a shared bathroom facility to be kept clean by a janitorial service, then fine. Otherwise, these tiny houses must be made complete. -I can’t decide if I want to stash a lovable loo someplace or just make a simple, easy-to-move-in-a-flatbed-truck outhouse type structure. Hmmmm. Beautiful craftWOManship! I’m sure driving down the road with this cute little house tons of people would want to know more about it. I agree with ChrystalOcean. The name of the company is a misnomer. The term “dwelling” would imply basic components of a home such as a bathroom. Great looking mobile unit! The setting and trailer almost look fake! Beautiful work- you guys should be darn proud! Hi There ! I had emailed Dee Williams as I have some serious questions, but as yet have not heard back. Are they considered houses or R/V’s, Will there be other areas like Fl. where there are extremely high foreclosure rates for workshops ? Is there a Q & A area that addresses these many questions ? Is there a ph. no. n email address, that I can reach PAD at ? With Katrina n the horrific amt. of homes being lost, the Gulf Coast truly needs this alternative, so please email me on how I can learn more, n then share this with others as well. Blessings & Light, Cecilia Thank you ! !